The sound and feel of running water, the sight of flashing and darting fish, the smell of fragrant flowering aquatic flora, and even the taste of edible, home-grown water plants satisfies all of our senses. A water garden is a soothing, beautiful addition to the indoor landscape, and it does not have to be a financial burden. Any non-porous container that can hold water—from the ridiculous to the sublime—can become an indoor water garden. Consider glass fish bowls or tanks, pre-formed ponds or pools, and thrift shop finds such as glazed watertight ceramic bowls and clear glass apothecary jars. Even such mundane kitchen equipment as glass cookware can be transformed into handsome water gardens. Simply cover the exterior with a layer of homemade "hypertufa." Mix two parts Quikrete concrete, three parts vermiculite, and three parts chopped sphagnum moss with enough water to moisten. Lather the outside of the container with a one- to two-inch-thick layer and let it dry overnight. More: Learn how to grow aquatic plants with shrimp in a glass bottle. Aquatic plants are grouped into three categories based on the way they grow—emergent plants, submergent plants, and floaters. Emergent plants are rooted in the ground and produce foliage that remains at or above the surface of the water; these include cyperus (Cyperus species), arrowhead (Sagittaria species), and water snowflake (Nymphoides species). Submergent plants, which are also firmly rooted in the soil, have leaves that remain below the surface of the water; they include elodea (Elodea canadensis) and eelgrass (Vallisneria americana). The third category, floaters, includes plants that freely float on the open surface of the water—though they may have been rooted in the soil as seedlings. This group includes duckweeds (Lemna species and Wolffia species), water chestnuts (Trapa species) and water lettuce (Pistia stratiotes). To make matters more complex, aquatic plants are divided into warm- and cold-water plants. The water plants indigenous to the warm waters of tropical South America, Africa, and Asia—such as the sword plants (Echinodorus species), Cryptocoryne species and water ferns (Ceratopteris species)—require permanent warmth, provided by an aquarium heater, for example. Cold-water submergent and emergent aquatics, which are indigenous to North America, Northern Europe, and temperate Asia—such as parrot feather (Myriophyllum species), Aponogeton species and calamus (Acorus species)—do well in an unheated pool, provided that the water temperature never dips below 50 degrees F.
To avoid disturbing the planting medium, fill the container slowly. Deflect the stream of water against the glass, a stone or your hand. To remove chlorine and fluoride, use a water conditioner from the aquarium store, a water purifier, or simply let the water stand, uncovered, for 24 hours. Never use cold water to fill up your water garden, as it will shock the tropical plants. For a small tank, gently warm the water in a non-reactive stockpot. A large pool should be filled a week or so before planting to allow the water to reach room temperature, unless it is artificially heated. There are two methods of cultivating plants in water. One is to install the plants directly in a growing medium spread on the bottom of a glass receptacle—as in the typical tropical aquarium. This technique looks best in clear glass containers. Remember that red- or blue-tinted or colored glass will filter out the light colors necessary for proper plant growth. An alternate procedure involves placing the plants into individual pots or crates, and submerging these in the garden. This strategy works well with pre-fabricated polyethylene or fiberglass pools, ponds, and tubs. As with any transplanting task, correct plant depth is crucial. Crown-forming submergent plants such as Echinodorus, Cryptocoryne, or Barclaya must not be planted too deeply—which means that you should plant them a little too shallowly, taking into account the final layer of gravel, which brings the substrate to the appropriate height. Branching or "stem-type" submergent plants, such as Anacharis, Hygrophila, and Ludwigia are usually sold as bunches of unrooted terminal shoots. They can be planted directly into the substrate, after removing the bottom foliage. Use a rock or stone to weight them down until they are rooted. Submergent floaters, such as Ceratopteris or Nymphoides, may simply be "released" and left to their devices; they will root as they grow. Emergent floaters such as Azolla, Salvinia or Lemna, may be treated in the same way. In nature, aquatic plants live in the nutrient-rich substrate of naturally occurring streams, ponds, pools, marshes, and fens. The soils are extremely high in organic matter, and the various species grow luxuriantly. However, these biotic mires are unfit for indoor use—their nutrient levels are so high that a natural equilibrium is hard to obtain in a contained indoor setting. The result is often a methane-rich, smelly, sludgy mess. Therefore, it is necessary to culture water plants in a more stable and less obtrusive (thus less fertile) substrate, relying on chemical fertilizers for nutrients. A soil recipe that works well for containerized emergent plants is one part soil to three parts builder's or aquarium sand. It's a good idea to wash the sand in a sieve until the water runs clear before use. A "mulch" layer of fine-grade aquarium gravel also helps prevent the soil from clouding the water. This recipe works for all sizes of emergent plants, such as taro (Colocasia species), papyrus (Cyperus papyrus), water maranta (Thalia dealbata), horsetail (Equisetum hyemale), or Chinese water chestnut (Eleocharis dulcis). For clear glass aquarium-style containers that are planted directly, or for small potted submergent plants, I use a mixture of equal parts coarse, sharp sand and pre-washed, natural, fine-grade aquarium gravel, with a little horticultural charcoal added for good measure. The charcoal is buoyant, so a post-planting layer of gravel is needed to avoid floating black bits. For tank- or bowl-style water gardens, put down a layer of substrate that is appropriate for the dimensions of the container, for example about two to three inches for a 20-gallon aquarium and about six inches for a 60-gallon tank. You can grow aquatic plants in any size container in any soil depth—simply cultivate the appropriate kinds. Slopes, valleys, or other topographic features can be fashioned as desired and held in place with flat river stones, sheets of shale, or lakeside driftwood (it's difficult to boil out all of the salts from seaside finds). Avoid using limestone or sea shells, which will change the pH level of the water. As with any transplanting task, correct plant depth is crucial. Crown-forming submergent plants such as Echinodorus, Cryptocoryne, or Barclaya must not be planted too deeply—which means that you should plant them a little too shallowly, taking into account the final layer of gravel, which brings the substrate to the appropriate height. Branching or "stem-type" submergent plants, such as Anacharis, Hygrophila, and Ludwigia are usually sold as bunches of unrooted terminal shoots. 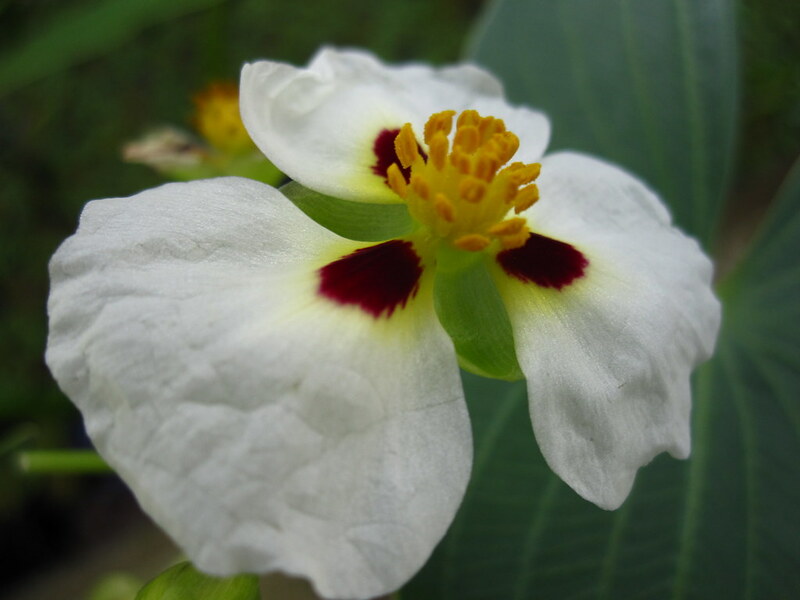 They can be planted directly into the substrate, after removing the bottom foliage. Use a rock or stone to weight them down until they are rooted. Submergent floaters, such as Ceratopteris or Nymphoides, may simply be "released" and left to their devices; they will root as they grow. Emergent floaters such as Azolla, Salvinia or Lemna, may be treated in the same way. One of the most critical keys to success with indoor water gardens is light—both quality and quantity. You need to provide between twelve and sixteen hours of light a day. Some standard aquariums are fitted with light hoods. The covers come with a choice of 25-watt incandescent bulbs or 20-watt Vita-Lite fluorescent tubes. The incandescent bulbs create enough heat to warm the water (in small tanks), but will burn the foliage of emergent plants. The Vita-Lites are cool, creating no extraneous heat, and will not burn the foliage. Larger gardens need larger lighting apparatus. Suspend a China-cap style lamp shade fitted with a 160-watt Gro-lux incandescent bulb 24 inches above a tub garden or a large bowl planting. Floor ponds and pools need special attention. Low-hanging fixtures will work, of course, but will block the view of the garden and look foolish. One or more ceiling-mounted 400-watt HID lamps will work well, but even these may not provide enough light for water-lilies (Nymphaea species) and lotus (Nelumbo species). If you don't want to rig up a lot of artificial light, take advantage of aquatic plants suited for shady situations. Consider planting arrowheads (Sagittaria), calamus (Acorus), Aponogeton, elodea (Elodea), water clover (Marsilea), or quillwort (Isoetes), for example. If you prefer to think small, try placing a water garden on a windowsill that gets morning sun. Or how about a wine glass or turtle bowl cultured under a desktop goose-neck lamp with a circular fluorescent bulb? Newly planted water gardens are susceptible to blooms of algae. This is a normal occurrence. As the algae become overpopulated, they eventually die off, and the water becomes permanently clear. Do not remove the green water and replace it with fresh—this will not allow for the natural "bell curve" of algae growth and death. Reducing the amount of light (if possible) will discourage algae growth. Freshwater snails will eat the algae from container walls and leaf surfaces. However, if there are too many snails, they may clog up filters and pumps. Avoid using wild, pond-caught snails. Never use a commercial algicide—one careless application will destroy all of the plants. Indoor water gardens need the same care as their exterior equivalents. Dead foliage must be removed weekly. Overgrown floaters must be thinned out so that the ambient light reaches the underplantings. Water evaporates quickly indoors, making it necessary to top off with additional water occasionally. A regular regimen of fertilizing is crucial for success. Aquatic plant food is sold in pellets that can be directly inserted into the soil every month. For large fish-free pools, mosquitoes may be a problem. Try using mosquito dunks that contain the bacterium Bacillus thuringiensis var. israelensis, which is deadly to mosquito larvae, but harmless to humans, pets, plants, and fish. Another useful product, Pond Saver, is a concentrated blend of beneficial bacteria which quickly biodegrade the organic matter in water that causes clouding, sludge, and foul odors. It is not harmful to fish or plants. Scott D. Appell is a regular contributor to BBG publications and the author of four books, Pansies, Lilies, Tulips, and Orchids. He lives and gardens on the island of Vieques, Puerto Rico. A South American Aztec Arrowhead (Sagittaria montevidensis) rises from the bog in the Aquatic House of the Steinhardt Conservatory. 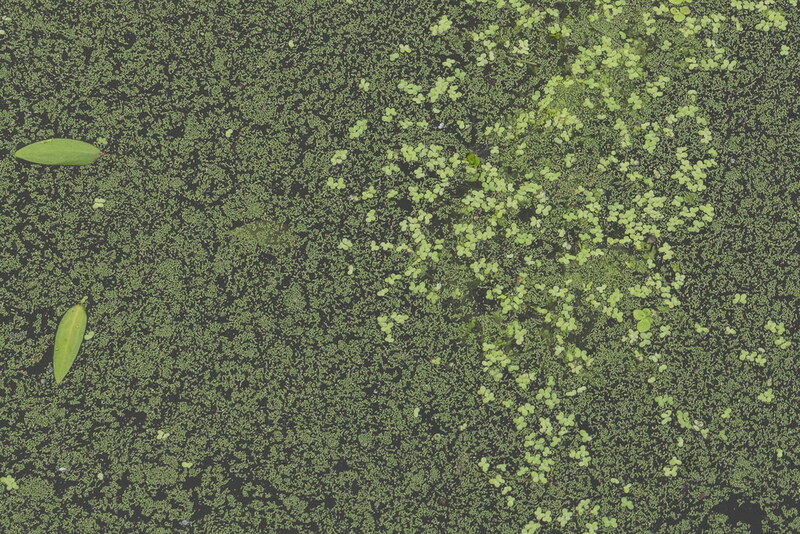 Here you can see Potamogeton epihydrus (ribbonleaf pondweed) on the left, Lemna minor (duckweed) to the right, and Wolffia borealis (watermeal) throughout. Photo by Uli Lorimer. 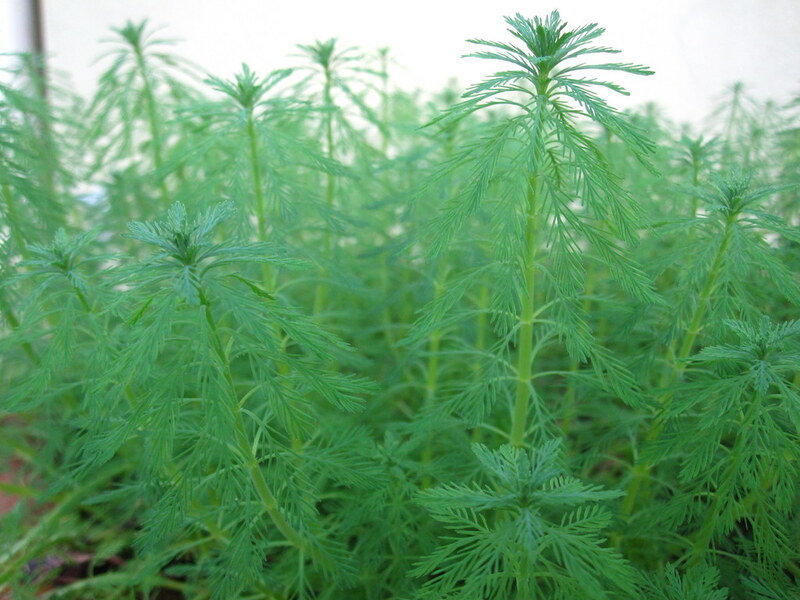 Myriophyllum aquaticum in the Aquatic House of the Steinhardt Conservatory.